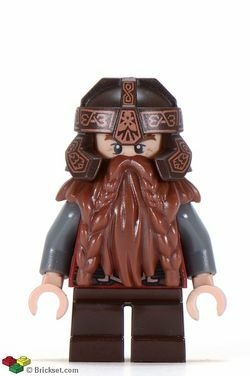 Gimli is a minifigure released in May 2012 for The Lord of the Rings theme. 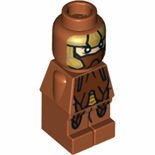 He has appeared physically and in LEGO The Lord of the Rings: The Video Game. Excluding his legs, every piece that makes up Gimli is exclusive to him. His beard is light brown and covers his shoulders, mouth and the front of his torso. It has two braids running down the front from his mustache. His face is light nougat with medium nougat printing of wrinkles around the eyes and forehead. He has bushy brown eyebrows and black eyes with white dots as reflections of light. His head is double sided, with on side sporting a neutral expression and the other an angry one. However, as his mouth is covered up completely by his beard, the difference is undetectable unless his beard piece is removed. Gimli's helmet is dark brown with lighter markings that form intricate patterns. It covers the top and back of his head and has two protrusions that cover his cheeks. This, coupled with his beard, makes Gimli's eyes and eyebrows the only visible part of his head. Gimli's torso is chiefly dark red, with grey arms and hands that are light nougat. It has printing of two thick brown straps that appear to be made of scales running down his front, forming an X. A wide belt with a golden buckle covers the lower part of the straps. At the collar, a grey shirt is visible behind the red one. Gimli's legs are dark brown and match his helmet. Gimli, son of Glóin, was a Dwarf, member of The Fellowship of the Ring along with Frodo Baggins, Samwise Gamgee, Meriadoc Brandybuck, Peregrin Took, Gandalf, Aragorn, Legolas Greenleaf and Boromir. As his job was to protect the Ring-Bearer, Frodo, he fought Orcs in the Mines of Moria and Uruk-hai at the battle of Amon Hen. At that battle, Merry and Pippin were captured, Boromir was killed, and Frodo and Sam continued the journey without their companions. Gimli, Aragorn and Legolas tracked the band of Uruk-hai that had captured Merry and Pippin to the forest of Fangorn, eventually being led to Gandalf, who had died after his battle with Durin's Bane, and now known as Gandalf the White. The forces of evil were growing stronger and Gandalf needed them to help him defend the last free kingdoms of men, starting with Rohan. An army of ten thousand Uruk-hai were on their way to seige Rohan, against only about three hundred men of Rohan. The people fled to Helm's Deep, the fortress from which they could defend themselves. Gimli and the others fought the Uruks and with the help of several new forces, including Elves of Lothlórien, led by Haldir, and the Riders of Rohan, led by Éomer, defeated them. Gimli later fought at Gondor, defending the City of Minas Tirith from hundreds of thousands of Orcs, and then at the Black Gate of Mordor where Sauron and the One Ring eventually met their downfall. After the end of the War of the Ring, Gimli became lord of the Glittering Caves at Helm's Deep. Later, he and Legolas (being great friends) departed to the Undying Lands, and Gimli became the first and only Dwarf to visit them. Gimli is portrayed by John Rhys-Davies, who also provided the voice of Treebeard in the film, and played Sallah in Indiana Jones. Gimli has eyes like a hawk, ears like a fox. Well, sort of. He strongly distrusts Elves, but when the time comes for the Fellowship to set out for Mordor, Gimli is ready to fight beside Legolas. He may be shorter than most of his companions, but he is strong as an ox, and quick to swing and throw his axes at anyone who threatens his friends or their mission - no matter how big they may be. Whatever Gimli does, he is committed to the end. Gimli Gimli has eyes like a hawk, ears like a fox. Well, sort of. He strongly distrusts Elves, but when the time comes for the Fellowship to set out for Mordor, Gimli is ready to fight beside Legolas. He may be shorter than most of his companions, but he is strong as an ox, and quick to swing and throw his axes at anyone who threatens his friends or their mission - no matter how big they may be. Whatever Gimli does, he is committed to the end. This page was last edited on 12 January 2016, at 22:52.